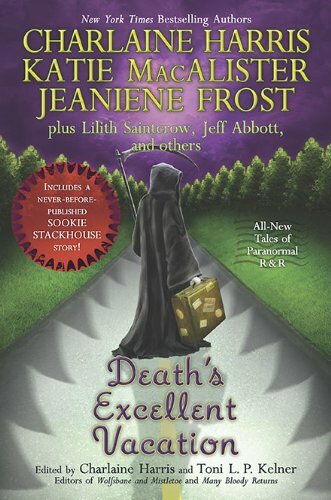 Death's Excellent Vacation, an anthology edited by Charlaine Harris & Toni L.P. Kelner, debuts at number 8. Charlaine Harris' Dead in the Family maintains its position week at number 17. For more info about this title: Canada, USA, Europe. Justin Cronin's The Passage is down five positions, ending the week at number 19. For more info about this title: Canada, USA, Europe, AbeBooks. Sean Williams' Star Wars: The Old Republic: Fatal Alliance is down ten spots, finishing the week at number 23. For more info about this title: Canada, USA, Europe, AbeBooks. Kelley Armstrong's Waking the Witch is down eight positions, ending the week at number 24. Charlaine Harris' Dead and Gone is up five spots, finishing the week at number 17. Charlaine Harris' Dead Until Dark is up six positions, ending the week at number 25. Stephenie Meyer's The Host is down four positions, ending the week at number 28 (trade paperback). Is there any other gauge besides the New York Times Bestseller List? Seems what sells isn't really a reflection of what's good out there. I'm more in interested in authors that take the chance to create something lasting and good, not necessarily profitable.